Stolen Sharpie Revolution (5th edition!) Is back from the printer! 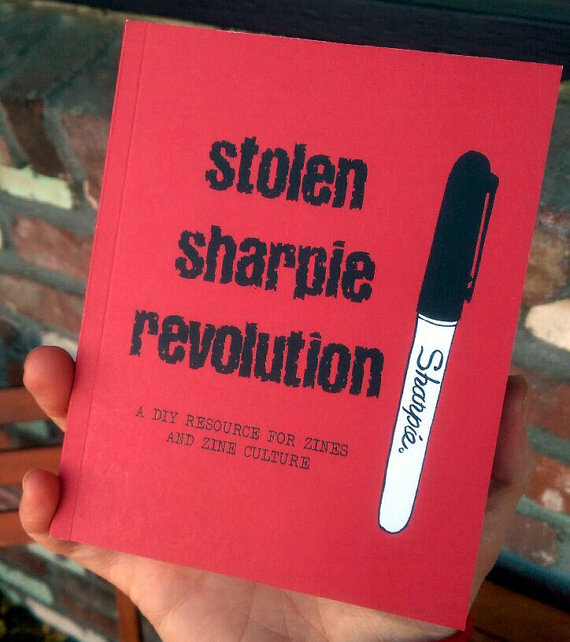 After a successfully funded kickstarter the new edition of Stolen Sharpie Revolution has returned from the printer! It is available direct from the Portland Button Works Etsy shop and the Portland Button Works website as well as Pioneers Press, Powell’s Books, and Amazon.com More distros and stores to follow soon! If you are interested in carrying Stolen Sharpie revolution get in touch: portlandbuttonworks@gmail.com for wholesale pricing. If you are in the UK or Europe and would like to save on postage, consider ordering from Steve Larder in the UK. Since 2002, Stolen Sharpie Revolution: a DIY Resource for Zines and Zine Culture has been the go-to guide for all things zine-related. This little red book is stuffed with information about zines. Things you may know, stuff you don’t know and even stuff you didn’t know you didn’t know! 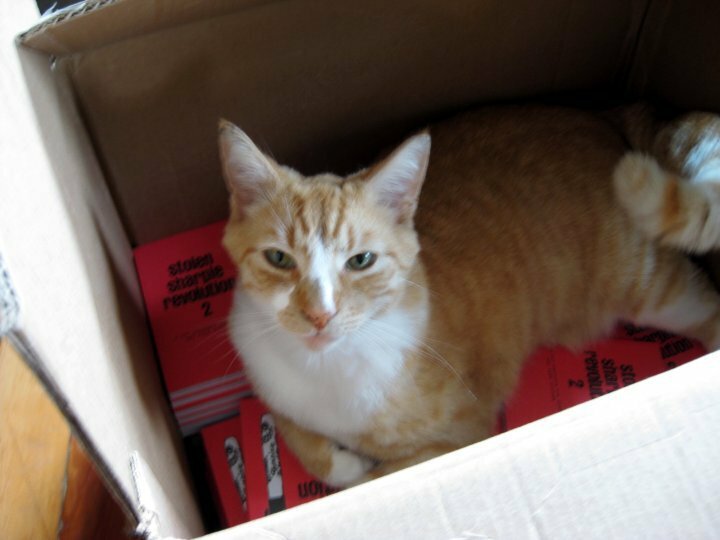 Stolen Sharpie Revolution contains a cornucopia of information about zines and zine culture for everyone from the zine newbie to the experienced zinester to the academic researcher. 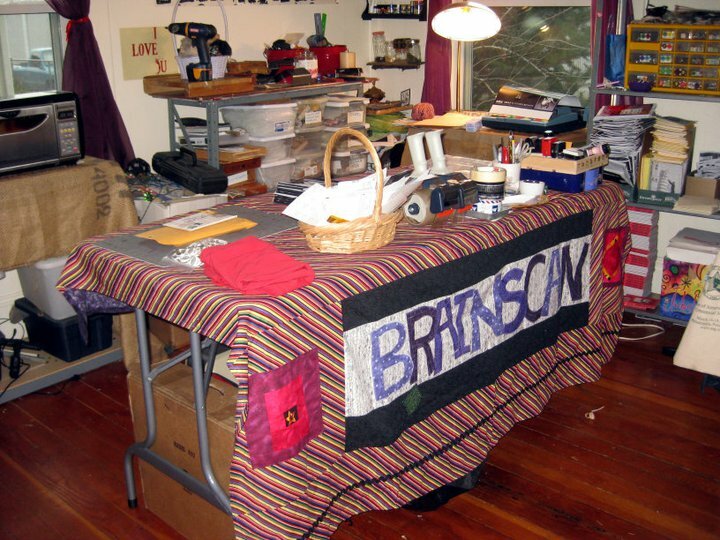 Stolen Sharpie Revolution consists of thoughtful lists and step-by-step how-to guides on everything from definitions of a “zine,” where to find zines, why they are important, how to make them and how to participate in zine culture. This book has everything you need to get started creating your own zine, or to figure out what to do with the zine you just made. Stolen Sharpie Revolution serves as both an introduction into the wide world of zine culture and as a guide to taking the next step to become a part of it. Stolen Sharpie Revolution Kickstarter has less than 60 hours left! Stolen Sharpie Revolution: a DIY Resource for zines and zine culture (5th Edition) Kickstarter is less than 60 hours to completion! We have made our $6,000 goal with 4 days to spare! I’m not feeling completely proactive about setting a stretch goal, but here’s the thing. As of now There is enough for all the rewards and to print 4,000 copies of the 5th Edition of Stolen Sharpie Revolution. If we can hit $7,000 we can print 5,000 copies! Can we do it? I’ve added 10 more 10 packs for schools, distros, stores, or for you to give away as gifts! There are still some t-shirts and Sharpie rewards. Also, if you would like to add to a level you have already committed to, you can change it and when I sent the survey at the end of the campaign you can just note that you’d like to add a Little Free Library patron reward for $25 or an extra copy of the book for $15. So, we have less than 60 hours! Can we make it happen? There are mere days left for you to support the Stolen Sharpie Revolution Kickstarter! This is just a quick note to remind you of the Stolen Sharpie Revolution: a DIY Resource for Zines and Zine Culture (5th edition) Kickstarter that is going on now! 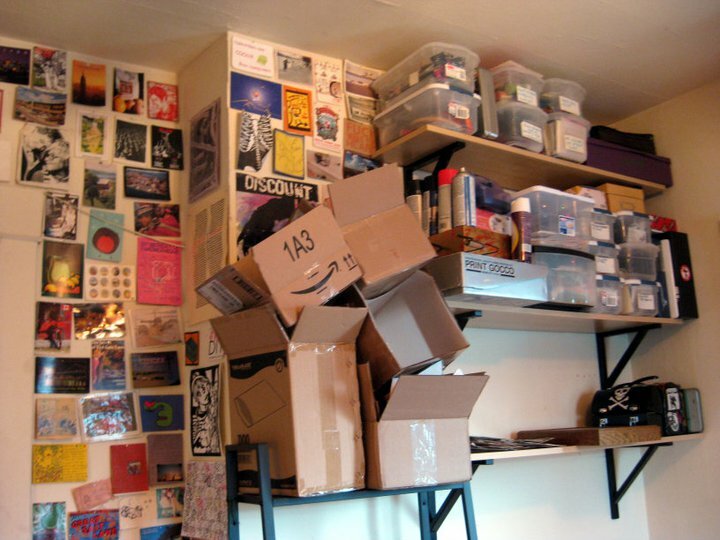 Since 2002 Stolen Sharpie Revolution has been the go-to resource for zines and zine culture. With over 21,000 copies in print, this book is poised to break the quarter-hundred-thousand copy barrier at least BUT I NEED YOUR HELP! Depending on when you are reading this there is either 9 or 8 days left to go and we are still short over $2,000 out of the $6,000 we need. So, if you were considering backing this project, THE TIME IS NOW! You can get yourself some fun rewards including an actual Sharpie Marker with “Stolen Sharpie Revolution” printed on it, a Stolen Sharpie Revolution T-shirt, all 5 editions of Stolen Sharpie Revolution, or get a pack of 10 for your store, distro, class or gift for friends, or have me do the layout for your zine! Maybe you already backed the kickstarter and are getting a copy of the book. Why not raise your donation level by $25 and donate a copy of Stolen Sharpie Revolution in your name to one of the many Little Free Libraries in Portland. If you haven’t had a chance to check out the updates I suggest you do so. You can see some of progress and some photos of page layout, some early milestones and backers of the projects will see exactly how many gluesticks and rolls of double sided tape the layout took! If you were thinking that you would just buy a copy of SSR later you might want to reconsider that as these will not be available to buy until AFTER the kickstarter rewards have been sent out. We are estimating that copies will not be available until late November. So, if you want to get a copy of the new edition of Stolen Sharpie Revolution you MUST act now and support the Kickstarter! 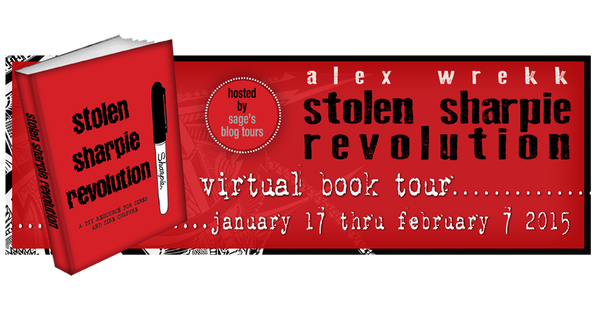 One more big announcement: The iconic covers of Stolen Sharpie Revolution will be receiving a bit of an update! My buddy Steve Larder, illustrator and author of Rum Lad zine has agreed to drawn me a new spiffy looking Sharpie marker for the cover! I’m so excited because I just I love Steve’s artwork. You should check it out as well. Ok, that’s about it for now. Thanks for sticking with me and let’s get the Stolen Sharpie Revolution kickstarter to it’s close! Stolen Sharpie Revolution (5th edition) Kickstarter Update! We have 18 days to go and I wanted to post a little run down of the progress. 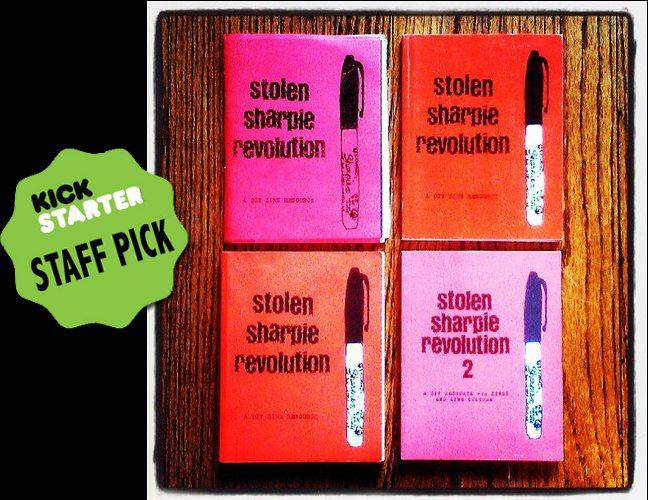 Day 3: The Stolen Sharpie Revolution Kickstarter became a “Staff Pick” on Kickstarter AND we hit the first $1,000. Stoked! Day 7: We hit 25% of our total total and I started using doubled sided tape instead of glue sticks. Day 8: We hit 33% of our goal and I launched a tumblr giveaway. Check it out on tumblr and feel free to reblog for a chance to win a copy of the book and some other goodies. Day 10: I finished with all of the content layout! The page count for the 5th edition of Stolen Sharpie Revolution will either be 152 or 160 pages depending on a few things that are yet to be determined. Day 12: We reached 100 backers! I’m hoping to break the half-way point: $3,000 or more this weekend. I’d love it if you could help me reach that goal! 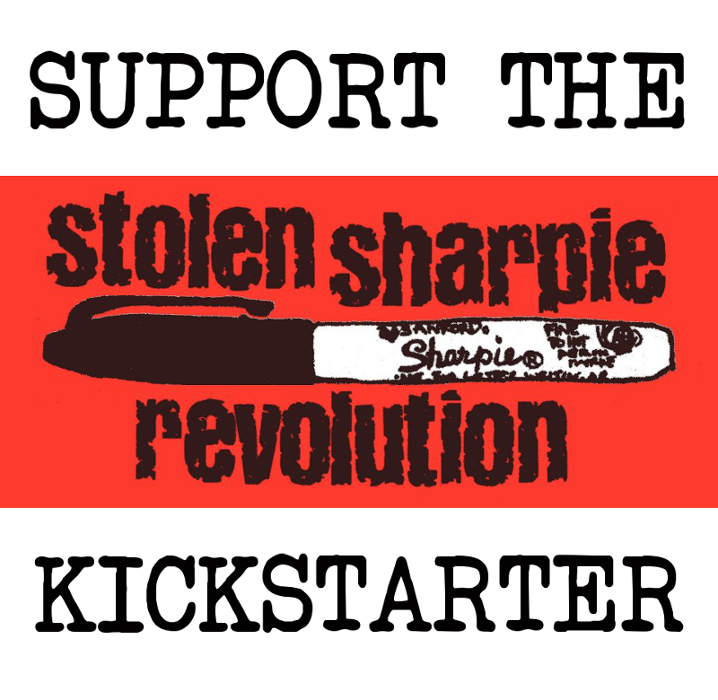 Stolen Sharpie Revoltion (5th Edition) Kickstarter Campaign! We’re a Staff Pick! I am launching a kickstarter to print the 5th edition of the book Stolen Sharpie Revolution: a DIY resource for zines and zine culture and I need your help! SSR has been the go-to guide for all things zine-related for over a decade and we want to keep it going for many more! This little red book is bursting with all things ZINE: things you may know, stuff you don’t know and even stuff you didn’t know you didn’t know! 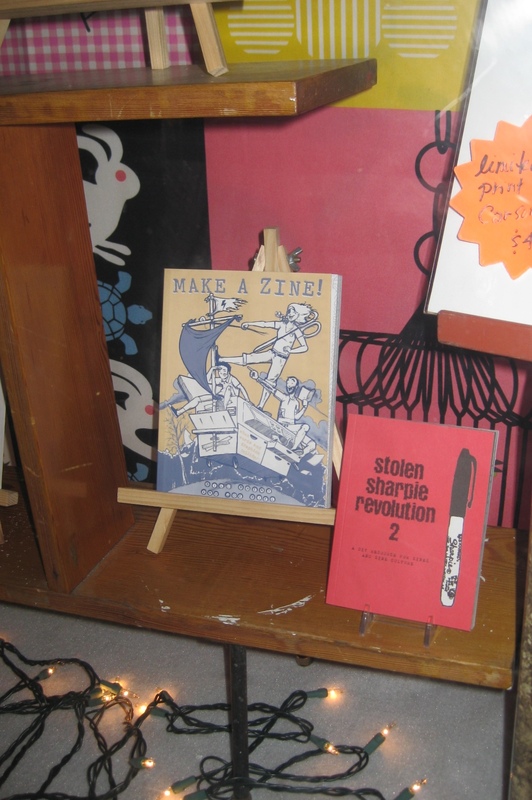 Stolen Sharpie Revolution is a cornucopia of information about zines and zine culture. 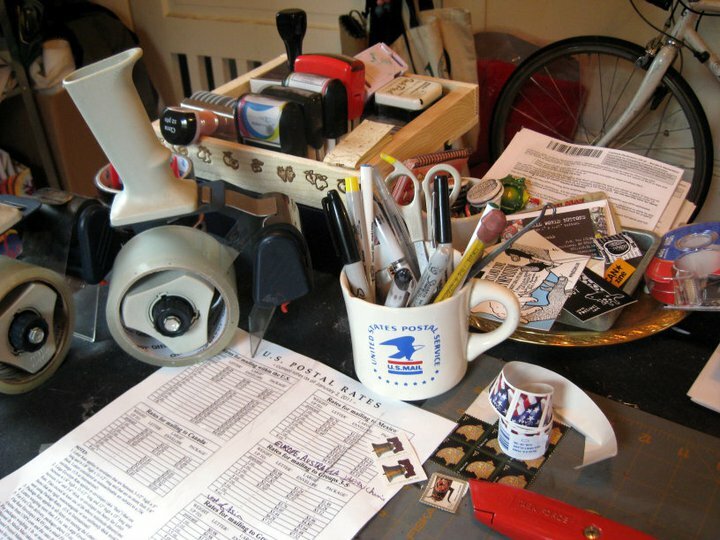 It’s for everyone from the zine newbie to the experienced zinester to the academic researcher. It is beloved by zinesters everywhere and has even been used in university classrooms as a basic text for understanding zines. With over 21,000 copies in print, this book is poised to break the quarter-hundred-thousand copy barrier at least BUT I NEED YOUR HELP! Help fund this kickstarter by pre-ordering a book or, get yourself a fun reward. Working on the 5th edition of Stolen Sharpie Revolution and I need your photos! With 21,000 copies of the book in print through 4 editions, Stolen Sharpie Revolution has been the go-to resource for zines and zine culture since 2002. However, Stolen Sharpie Revolution is currently out of print. I’m about to launch a Kickstarter campaign to fund a 5th edition and I need your help! 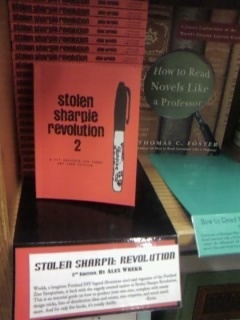 I’d like to make a Kickstarter promo video with photos of Stolen Sharpie Revolution, including your photos! Show me photos of SSR on your bookshelf, in a shop window, on a table at a zine fest. Show me SSR with with you cats, dogs, or hedgehogs! I’d love to see a copy in the middle of you floor scattered with zine making scraps, tucked out of your backpack, or being read in public. All submissions that are included in the video will receive a free copy of the book when it is printed. 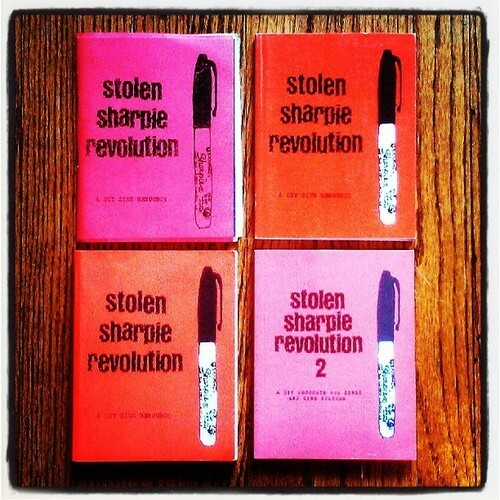 Did you know that the zine resource listings that have always appeared in the back of Stolen Sharpie Revolution are now collected and updated on the StolenSharpieRevolution.org website? The resources were always the most difficult part of upkeep and a website makes this so much easier. 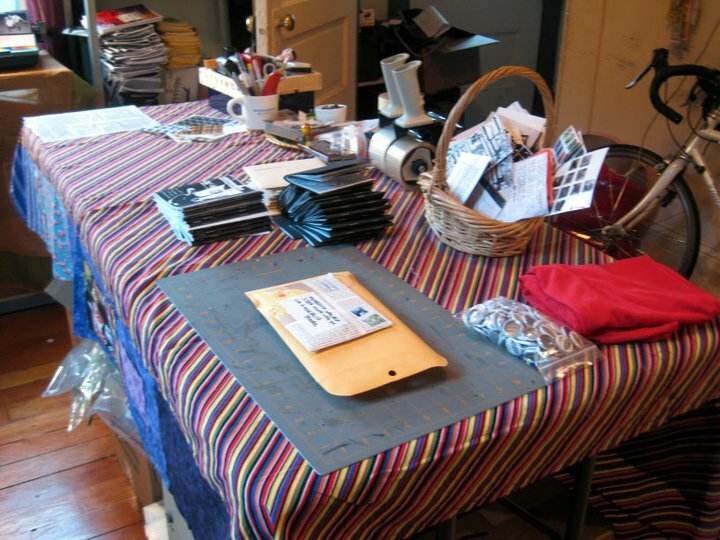 Check it out for zine distros, stores that sell zines, a calendar of zine events and more! As always SSR is only as good as the information I have. If you see that I’m missing something, a new zine event, a shop in your town that sells zines, a zine distro that hasn’t been included, please send a message through the contact form on the site and I’ll get it added. Please reblog and spread the word! *Multiple copies received from a single person will result on only one free book. Owner of submitted photo reserves all rights to submitted images but may be asked for it to be included in promotional materials. 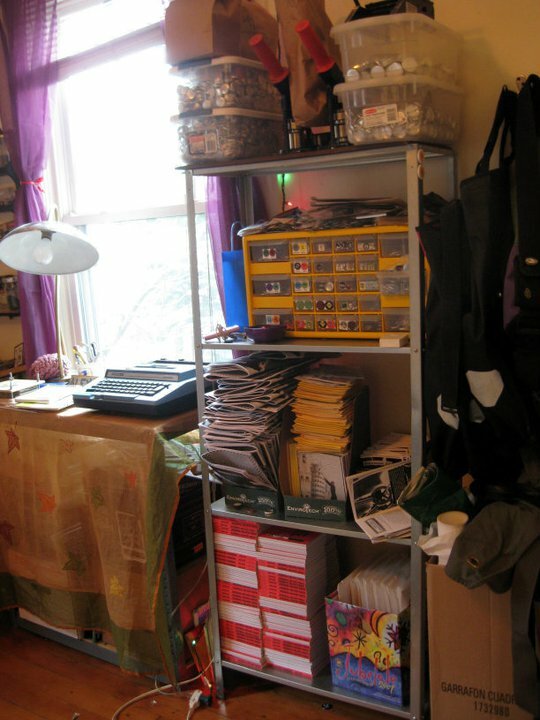 We are soooo close to having total confirmation for the 2010 Portland Zine Symposium! It WILL NOT be in the PSU Ballroom as usual but if all goes right it WILL be at PSU. We are just about ready to confirm the dates for late August. Stay tuned for more! Also, see my later post about artwork and tell me how genius ZINE ARCADE is as a theme. My book has been on an end cap at Powell’s in the Blue Room for awhile. I guess that’s why they have sold so many copies, eh? I also spotted SSR2 in the window of the lovely Portland Zine shop Reading Frenzy.